There's Never Been a Better Time to Buy! 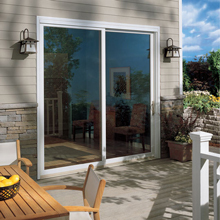 If you’re interested in replacing leaky, hard-to-open patio doors on your home in or near Minneapolis, Minnesota, then the time has come to call the home renovation professionals at DuBois ABC Seamless. Since 1980, we have helped countless homeowners throughout the region who wanted top-notch home improvement products installed on their homes with expert craftsmanship. Whether they were looking for upgraded patio doors, new windows, home siding, or other residential modifications, DuBois ABC Seamless has proven time and again that we are the right company to call. Our precision-built glass doors are constructed to hold up well in all kinds of weather, and to allow the maximum amount of glass for the most generous viewing area imaginable. With doors from DuBois ABC Seamless, you’ll be able to welcome the beauty and splendor of the outdoors into your home without ever sacrificing comfort. Plus, you may choose to have a transom window added above your entryway, which adds height and visual appeal, while also bringing in even more natural sunlight. Whether your home décor is traditional, contemporary, or some blend of both, DuBois can install the perfect patio door to bring your home to life. Call DuBois ABC Seamless today to learn more about our extraordinary patio doors and how they can add beauty and light to your home today. Discover for yourself why DuBois is the home-improvement contractor of choice for homeowners living in Minneapolis, MN, and all surrounding communities. Our estimates are free, informative, relaxed, and comfortable! We are the Twin Cities exterior remodeling specialist, providing homeowners with quality, time-tested products that are designed, manufactured, and installed to last for the life of your home. © 2019 DuBois ABC Seamless. All rights reserved. Get 10% Off Your Gutter or Gutter Cover Project — There's Never Been a Better Time to Buy!